Cloud accounting is the modern way of accounting in which accounts are managed by storing documents virtually in a cloud. More than 60% businesses have used cloud accounting and 80% of them have saved both time and money (based on a recent survey). Why to choose cloud accounting ? You will be able to access your financial position 24 hours 7 days a week. This will help to make prompt financial decision. You might be in need of applying business loan that requires the details of your financial capacity. By having access to cloud accounting, you will be able to provide the details instantly rather than having to go back home and search for the documents or worse, if your accountant is on a holiday. Create a quote, email an invoice and record an expense anywhere, anytime using your mobile device. Save time from preparing and storing paperwork, so you could focus more on growing your business. Your documents will be stored safely in the cloud, compared to traditional accounting in which documents are stored physically in computers. What if there were a fire that destroys the office or a virus that erases all your documents? 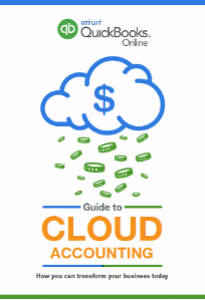 To learn more about cloud accounting, click on the “Guide to Cloud Accounting”, Intuit’s comprehensive guide.